Disasters strike, news channels are filled with images, sympathy and resources are directed to the immediate victims. But once the news cycle has moved on, too often, so has the public’s awareness of what is happening for the people still in recovery. In December 2011, poet Heather Bourbeau and ceramicist Liz Worthy decided to collaborate on a project that would bring awareness to the continued struggles of those affected by the March 2011 disasters in Japan, raise funds for a project that was supporting those most affected, and show the people of Japan—in whatever small way—that we were still thinking of them. Given the rotating oceanic currents or “gyres”, what happens in Japan will eventually be physically felt on the West Coast of the US, if only in debris, as our footprints are felt on the shores of Japan. Our project, “Message in a Bottle”, features poems written in English and using Japanese forms to demonstrate that we are connected and are not forgetting the struggles of the Japanese, even as the story leaves the front pages. We partnered with the Japanese Society for Traumatic Stress Studies (JSTSS), which is working with victims and counselors from the area to provide ongoing psycho-social support. All proceeds from bottle sales have gone to the JSTSS. On March 11th, 2012, we tried to launch one bottle symbolically into the ocean from San Francisco, to mark the anniversary of the tsunami and to hopefully eventually reach the shores of Japan, but the weather was too rough. 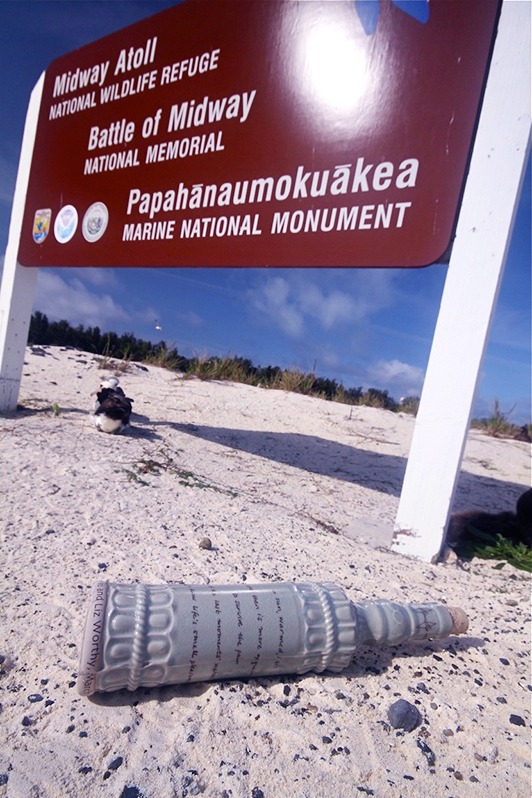 In an effort to bring the bottle closer to the gyre that connects us, Wayne Sentman took a bottle with him to his research station on Midway Island (photographs from Wayne link “Trip to Midway” section). We first showed the art at our show in May 2012 at Ruby’s Clay Studio in San Francisco, where visitors made origami cranes with their own poems or good wishes for our Japanese partners. Several of Wayne and Luis’ photographs were featured at the exhibition. We had a subsequent reading and sake sale at Modern Times bookstore in San Francisco. To mark the second anniversary of the disasters, Captain Jeff Idema launched two bottles, one at the entrance of the Sea of Japan, the other just south of Erimo Saki, where the Tsugaru Straits enter into the Pacific. They should land in the next two years. If you come across a bottle, please contact Heather or Liz.